Lourdes Central School, Bejai, Mangaluru conducted Remodelled Structure of Assessment for teachers of Classes VI – X on 31st January 2018 in the A.V. Room. 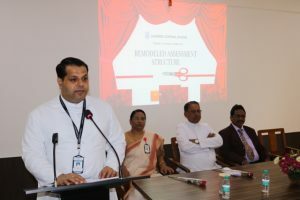 The programme began at 9.15am with a prayer song headed by Mr Ivan Mascarenhas. 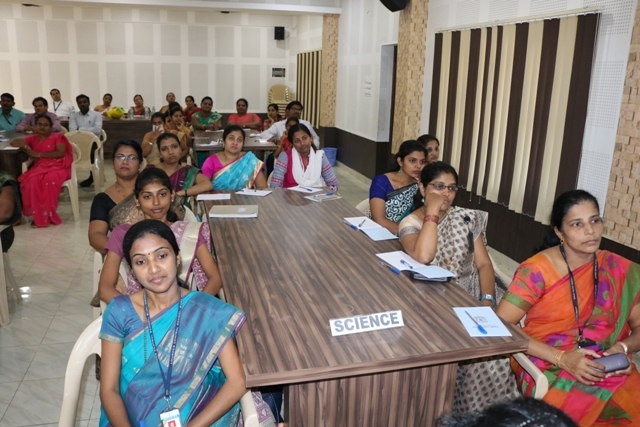 Ms Dilla Colaco welcomed the gathering and introduced the Chief Guest Mr E Daniel Raju, Joint Director, CBSE COE Kakinada. 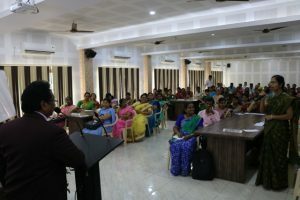 The Principals of Jnana Ganga School – Ms Dechamma, Manipal School – Ms Auradha Shivaram and Sharada Vidhya Niketan – Ms Sushma Dinakar; and teachers from St Aloysius Gonzaga, Carmel School, SMC School – Kinnigoli and Lourdes Central School – Bejai were present on the occasion. 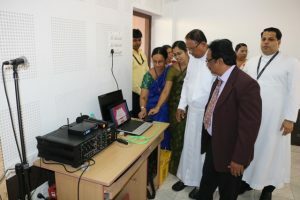 The programme was inaugurated by the Manager of Lourdes Central School Rev. 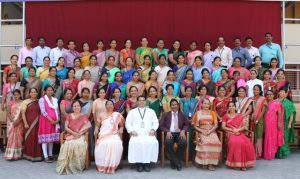 Fr Wilson Vitus L D’Souza. 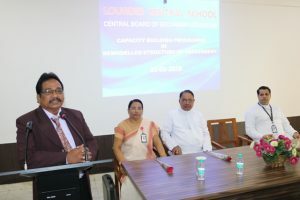 The Principal of Lourdes Central School Rev. 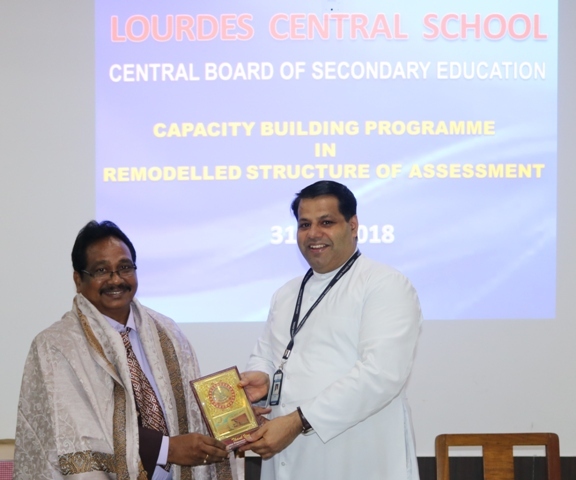 Fr Robert D’Souza gave an introductory note and said that he was delighted to have Mr E Daniel Raju, a versatile personality in CBSE Curriculum. The Manager of Lourdes Central School Rev. Fr Wilson Vitus L D’Souza delivered his address and said that the Principals and teachers were fortunate to have the Resource Person Mr E Daniel Raju and expressed that his presence had made everyone happy. He stressed that teachers need to upgrade their knowledge, train their minds and make use of this programme by implementing it in their lives. The Workshop commenced at 9.30am. The Resource Person Mr E Daniel Raju, Joint Director, CBSE COE Kakinada spoke on the Remodelled Structure of Assessment for Classes IX and X effective from the academic year 2017-18. 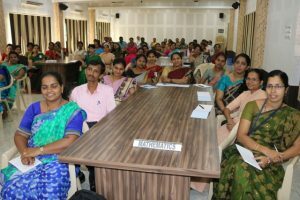 Mr Daniel Raju shared his experiences and said that teachers need to have a mother’s heart towards the students. Every child in the school is important and has to take part in one or other activity. Teachers were acquainted with the different parts of Internal Assessment, syllabus pattern for examination and preparation of a balanced question paper. Handouts on periodic tests, preparation of question paper, notebooks, case study, preparing rubrics, subject enrichment activity and work education were given. Teachers had to sit subject wise in groups and fill up the handouts. Total – 100 Marks; Annual Exam – 80 Marks; Internal Assessment – 20 Marks. 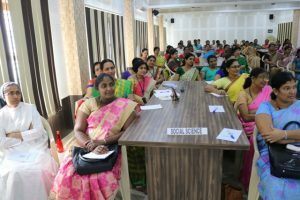 – Board will conduct an Examination for 80 marks. 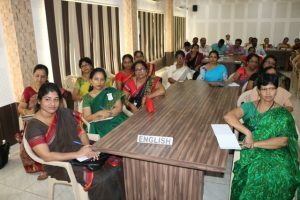 – 100% syllabus of each subject of Class X only. – Both Marks and Grades will be allotted by the Board for each subject. – However, School will also conduct Pre-Board Exam for the students. – School Based Exam at the year end. – 80 Marks Exam for each subject covering 100% of the syllabus of Class IX. Notebook Submission – 5 Marks; Subject Enrichment Activity – 5 Marks. – Three Periodic Tests to be conducted in the academic year. – Regularity, Assignment Completion, Neatness and notebook upkeep. Language – Activities aimed at equipping the learner to develop effective speaking and listening skills. Mathematics – Lab activities and Projects. 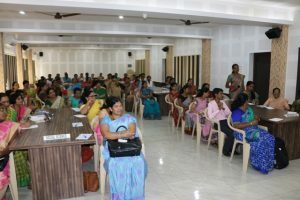 Social Science – Map and Project Work. – No up scaling of grades. Discipline: Attendance, Sincerity, Behaviour, Values – Students will be assessed on a 5 Point Scale (A – E).